Assassin’s Creed Odyssey has Metal Gear Solid style base management. As the series heads to the Greek archipelago, ships, which made their Assassin’s Creed debut in Caribbean pirate romp Black Flag return to help you travel from place to place. While Edward Kenway’s brig, the Jackdaw, obviously won’t be returning, ancient Mediterranean civilisations had their own ships. 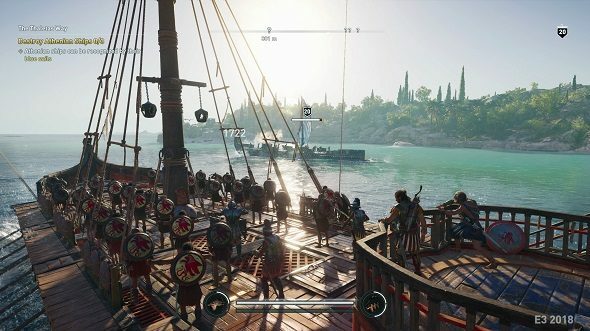 It’s likely that Alexios or Kassandra, the game’s male or female main character (the choice is yours) will take to the seas in a two-tiered Greek bireme. Sneaking and stabbing are the two best tool in any good assassin’s arsenal, so check out our list of the best stealth games. Like the Jackdaw, however, your new ship, the Adrestia, will be fully upgradable. You can tweak the sails, improve the strength of the hull, power up your rowers, and even give a boost to the ship’s ramming power (no cannons in Ancient Greece, sadly). In a feature that will be familiar to fans of Metal Gear Solid V, you’ll also be able to upgrade your crew. Assassin’s Creed Odyssey allows you to knock out any enemy soldier, before sending them back to the Adrestia. Now, obviously your ancient wooden warship isn’t quite as technologically advanced as the floating fortress that is Mother Base, but the parallels between the two, from a gameplay perspective at least, are relatively obvious. The Assassin’s Creed Odyssey release date is October 5. To tide you over until then, we’ve got a full list of Assassin’s Creed Odyssey abilities for you to check out, including a hefty Spartan kick to master, as well as the ability to tame wolves, which is going to be pretty high on my list of priorities.